UPPER CUMBERLAND – Unemployment rates rebounded this month, showing decreases across the region, state and nation. Although rates dropped overall, five counties in the UC had rates that remained higher than the national level of 4.1 percent, with Pickett County joining Clay County in the top 10 highest rates in the state at 5.3 and 5.4 percent, respectively. 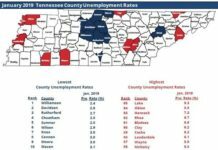 “It is encouraging when unemployment rates drop in every county across the state,” said Tennessee Department of Labor and Workforce Development Commissioner Jeff McCord. Across the UC, the rate dropped by half of a percentage point. Across the UC, rates were down in almost every county compared to 2018 numbers. 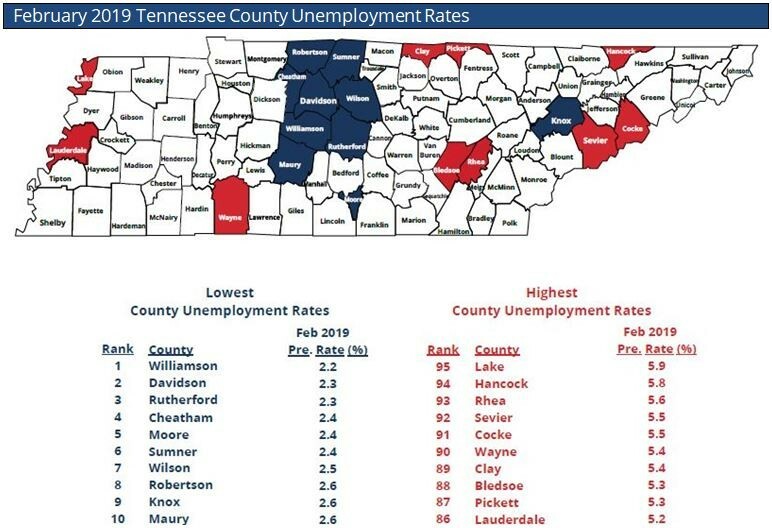 The only counties that saw an increase over 2018 were Clay and Pickett, and according to Henry Bowman, economist with the Upper Cumberland Development District, in small counties a slight change in the number of people employed can make it look like a big shift in employment. 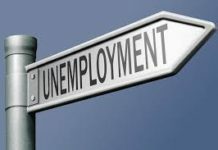 Three counties were below the state unemployment rate of 3.2 percent, Cannon (2.7), Macon (2.7) and Smith (2.9). All are included in the Nashville-Murfreesboro metropolitan statistical area (MSA). Rates for the other counties in the Upper Cumberland region were Cumberland (4.7), DeKalb (4.0), Fentress (4.0), Jackson (4.9), Overton (4.0), Putnam (3.3), Van Buren (4.7), Warren (3.8) and White (3.5).